Teeninfonet would like to wish Mr. Social Media Mogul Frankie J. Grande a very Happy Birthday! If you would like to send your birthday wishes head over to his twitter page! Frankie J. Grande Is Back on YouTube!! — Watch New Video Here! Frankie J. Grande has just released his first new video since coming home from being in the Big Brother House. Frankie had an amazing time in the house, but he for sure is happy to be home spending time with his family. In Frankie’s new video for #ToplessTuesday Frankie introduces us all to his Big Brother family. Be sure to watch the hilarious video below, and we can’t wait for his next video! Keep up with Frankie on his Twitter @FrankieJGrande!! Frankie Grande In The New York Times?! – See The Article Now! Today, June 8th, Frankie Grande was featured on the front section of the New York Times! The article can be seen in the photo above. 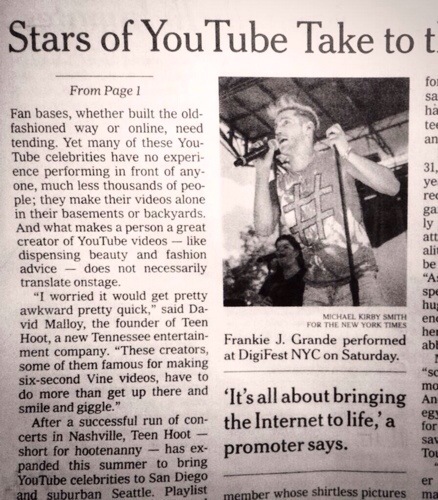 It talked about Youtube sensations and stars such as Frankie himself. The photo in the article was taken when Frankie was performing at Digifest this year!